Do you have an advisor that talked you into buying business development companies (known as BDCs), leveraged loans, or senior loans? It’s a good time to ask yourself if they understood what you would be risking when they made the recommendation? Sometimes, their broker/dealer (the company they represent) benefits from the sale of these products and may persuade brokers they are a good fit. Other times, the advisor may be following the crowd. It may also be possible they feel as though they can pick up enough quarters in front of the steamroller to make it worth it. If that is the case, do you want them to gamble with your life savings? Let me explain how I see the leveraged loan, BDC, and senior loan markets. First, yield hungry investors have enabled debt-ridden companies to issue more debt at extremely low rates. Like a credit card company allowing you to spend with no immediate recourse at rates around 5%. Now, what exactly are senior loans or leveraged loans, and BDCs? Leveraged loans are bank loans issued at a floating rate usually to companies that cannot tap the public debt market at longer maturities and lower rates. For this reason, the debt is considered speculative and risky. With BDCs, the idea is similar, but this asset class involves smaller issues and involves more risk. Think private equity, only on the debt side of the balance sheet (instead of the equity side). Leveraged loans or senior loans may be pitched as a safe investment because the loans are senior in the capital structure, but senior to what? Depending on the loan, there may not be any junior debt holders and you can be left with little recourse if the issuer defaults. Below, is a chart of the explosive growth of the leveraged loan market. Scared yet? What scares me is that 40% of these loans are issued to refinance existing debt. To use the credit card metaphor once again, this is like using another credit card to pay down your previous card. And this can be fine, as long as banks are lenders are willing to continue to extend the credit to you. But what happens when credit freezes and banks are unwilling to lend? This is where we would see some significant issues in the leveraged loan market. Better yet, what happens when the Fed hikes rates to the point where high quality bonds are attractive? This would create an environment where lenders sell their senior loans and taper their exposure to the asset class since they can get similar returns with less risk. Here, the leveraged loan issuers would have to entice investors by raising the interest rates they would have to pay on the debt which would stretch their balance sheets and further deteriorate their financial health. The problem is, the Fed has already started on this path…..
To make this worse, the borrowers are raising capital without offering anything in return for the lenders. Traditionally, borrowers must adhere to a strict set of bond covenants that are designed to protect the debt holders. These covenants will prohibit certain behaviors that would risk the lenders capital. Typical covenants include prohibiting a firm from issuing too much additional debt or paying out large dividends prior to paying back the bondholders. For the same reasons, a credit card company wouldn’t want you to buy a car you couldn’t afford if you didn’t have the money to pay off the credit card. 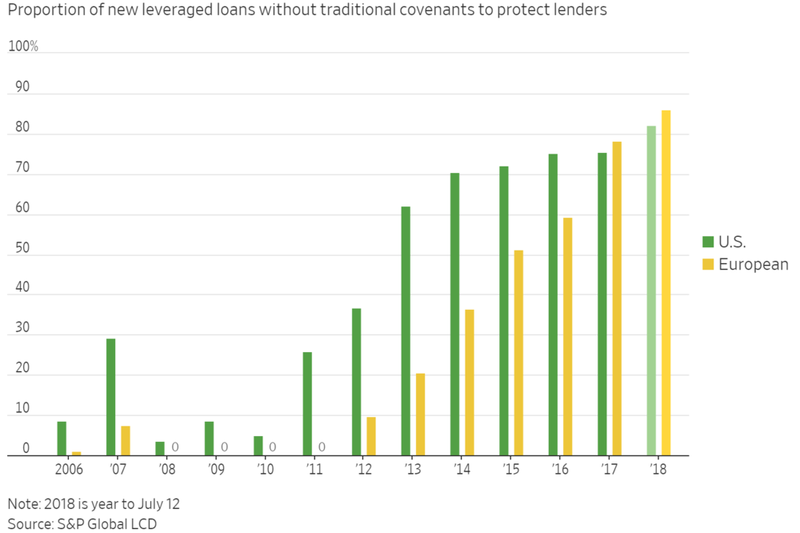 As you can see, these covenants were prevalent in over 90% of the leveraged loan issues prior to 2007, and from 2008-2010. Today, less than 25% of new issues have covenants to protect the lenders (synonymous with saying 75% of the issues are "cov-lite). A ghastly development. I’ve been at practices where advisors did not understand these risks and it pains me to say their clients may one day bear the brunt of this oblivious investing strategy. At Noble Wealth Partners, we focus on understanding the downside risks prior to seeking any upside opportunities. If you have concerns about your current portfolio, we are happy to talk to you.